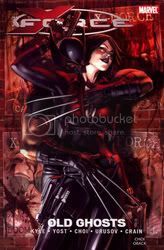 X-Force is still reeling from the aftermath of their first mission, but there's no rest for the wicked. Mutantkind's enemies have multiplied, but Cyclops has a new target for his black-ops team, and even X-Force doesn't believe who they're going after next! Superstar artists Mike Choi and Sonia Oback are on board as one of the X-Men's oldest foes returns! Collects X-Force #7-11. This current version of X-Force is far more deadlier than any incarnation in the past, and this second volume does nothing to disprove that fact. After the less than successful events of their first mission, X-Force is sent off after a villain from the X-Men's past, who seems to have gotten his hands on a strain of the Legacy Virus. Domino finds herself in the wrong/right place at the wrong/right time, and gets involved with the mission, as well. To top it all off, Wolfsbane is still brainwashed and Archangel is still psychotic and Cyclops is beginning to think that the problems that X-Force is having may be more than they can handle internally, and he feels the need to call in some help from the students. And what does Selene have to do with the story? New plot threads leading up to Necrosha-X! Overall, not a bad second volume to this new series.